I try to pretend like the world isn’t going crazy around us. I would love to just stick my head in the sand and be blissfully ignorant to the upcoming election. Most people that know me, would not be surprised to hear that I am not a super political person. Political issues are intimidating. When people start to discuss politics, I feel extremely incompetent and unnerved. I want to build a wall around my house and keep my family securely protected within. And l want to live in a happy bubble where everyone is treated fairly and respected. I want everyone to have their needs met. I want every child to be safe and secure and loved. That is what I want. Here is the thing. It seems to me that it would be obvious that if you have made the decision to work for an organization that is run by Catholic nuns, you would do so knowing that the business would be run according to the beliefs of the Catholic church. If you are not Catholic and choose to use birth control, that is up to you. ( Although, I beg you to please look into Natural Family Planning and the Couple to Couple league.) You have two options. 1) Don’t work there or 2) get these things through the affordable care act, through the government and leave the Sisters out of it. Why should an organization, that is and has always been staunchly prolife and against birth control, be forced to go directly against their beliefs??? And to make it even more messed up, there are major companies (ie Pepsi, Exxon and the US military) that are exempt from complying with this very mandate, you know, for financial reasons. Seriously!?!?! I just shake my head. So, now what? I honestly don’t know. But I know that I will be praying. I will be begging God to protect our religious freedom. I will be asking God to watch over the Little Sisters, who are courageously standing up for their beliefs. I will be praying for the upcoming presidential election. I will continue to ask God to guide us as we choose the next president. I am going to be honest when I say, I am kind of sick to the stomach about this election. I can’t, for the life of me, see how any of the options are going to be good. But that is where faith comes in. We need to ask for God’s protection and trust that no matter what the outcome, He will remain in our presence. One of the things that has always weighed on my heart is the whole issue of abortion. I know that it is a touchy subject, although to me, the truth has always seemed crystal clear. I have always wanted to somehow stand up and be a voice for the unborn, but for the last, I don’t know, zillion years, I have been pregnant or nursing or herding a little flock of Houghlings about. Because I wasn’t able to go out and take a stand physically, I have always opted to do so spiritually, offering up prayers for the unborn. The end of abortion is a constant intention during family prayers, each night. It is a tricky one to explain to the little ones, but still something that I feel needs to be addressed, albeit very delicately. In their little minds, it is impossible to even imagine a mommy not wanting to have a baby, let alone destroying the life of a baby that is already growing in her belly. We are now at a point in the life of our family that the kids are all a little bit older. Jonathan, the baby is already 4. This makes it much easier to actually do things. So that is just what we did. We volunteered to participate in our church’s Life Chain as part of Respect Life month. So from 2:00 until 3:00 this afternoon, we stood along Sunset Blvd holding signs and peacefully praying for all of the lives in jeopardy. As we held our signs, and the cars drove by, many honked there horns and gave us a thumbs up sign. Many smiled and waved in support as they drove by. I was standing there looking at my little ones, thinking about how this was such a good lesson for them. They were seeing first hand how great it is to stand up for something that you believe in. That is when it happened. A young 20ish looking girl came out of her apartment building across the street from where we were. She stood there looking up and down the street as she smoked her cigarette. Before I knew it, she was in her car and driving slowly down the street flipping us all off. Thankfully the little boys had no idea what she was doing, but the other kids looked on in horror. A few minutes later it happened again. And then a young “man” (I am using this term loosely, because there was nothing manly about what he did.) drove down the street, put his window down and yelled out as he passed Hannah and Gianna and the little boys and I, “Women deserve the right to f*%@ing choose!” That is how you are going to address children?? If you don’t agree with what we were doing, please, feel free to come and discuss it with me, their mother, but there is no reason to use that kind of language around my children. I was upset and frustrated by the incident, but then I realized that standing up for what you believe in and for what you know in your heart is right and true is what we are called to do. But in this fight for the truth, there is always persecution from the dark side. That is what makes the fight necessary. We have to speak up. We have to be willing to fight. Sometimes the fight is in the form of a discussion. Sometimes it is prayerfully standing alongside the road with a sign or praying in front of an abortuary. Sometimes it is in the form of praying a rosary. Whatever the way, we just need to keep fighting. The signs that we were holding, read things such as “Jesus Forgives and Heals” and “Adoption, a Loving Option”, “Abortion Hurts Women” and “Abortion Kills Children.” All of these things are true. There was nothing printed on the signs that could be taken as false. Abortion does, in fact, stop a beating heart resulting in the death of a child. And adoption… oh my, there are so many childless couples that would love to adopt a tiny baby. In fact there are many couples with a lot of children that would be thrilled to welcome another little one into the family. ( I absolutely would!) 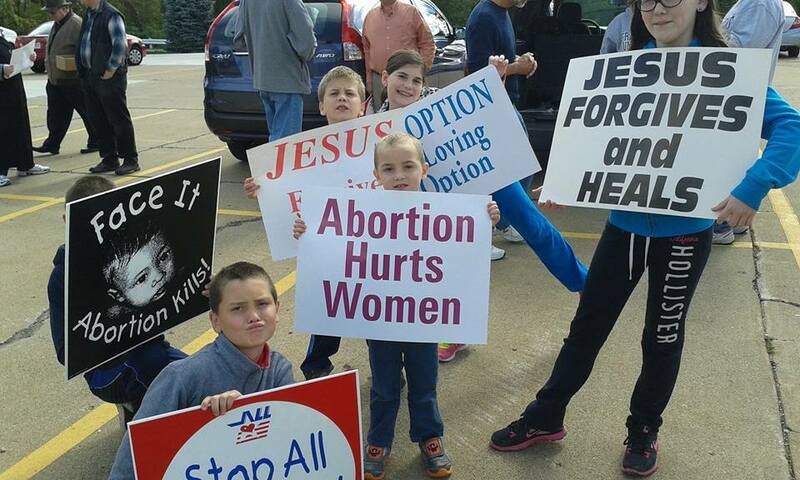 But the one sign that really resonated within me today,, was the one that said that abortion hurts women. I do not believe that every woman who chooses an abortion does so, fully believing that it is absolutely the best option. I cannot allow myself to believe that every woman that has an abortion, does so without a shred of remorse or regret. I know that there are women that feel that due to a medical issue, whether it is an issue with the baby or the mother, that they have no alternative. The belief that it is, somehow, merciful to end the life of a special needs child, breaks my heart. My heart aches for these women. I don’t care what brought them to this point. It really doesn’t matter. What does matter is that they need our prayers. They need our compassion. And ultimately, they need the forgiveness and mercy of a Loving Father. Please pray for the end of abortion. Please pray for all women that are contemplating abortion. Please pray for all women that have had an abortion. Please be a voice for those that can’t speak for themselves.